Unlike his successor, Senusret II maintained good relations with the various nomarchs or provincial governors of Egypt who were almost as wealthy as the pharaoh. His Year 6 is attested in a wall painting from the tomb of a local nomarch named Khnumhotep II at Beni Hasan. Co-regencies are a major issue for Egyptologists' understanding of the history of the Middle Kingdom and the Twelfth Dynasty. The French Egyptologist Claude Obsomer wholly rejects the possibility of co-regencies in the Twelfth Dynasty. Author Robert D. Delia, and German Eyptologist Karl Jansen-Winkeln have investigated Obsomer's work and have concluded in favour of co-regencies. Jansen-Winkeln cites a rock stele found at Konosso as irrefutable evidence in favour of a co-regency between Senusret II and Amenemhat II, and by extension proof of co-regencies in the Twelfth Dynasty. The American Egyptologist William J. Murnane states that "the co-regencies of the period are all known ... from double-dated[note 2] documents". The German Egyptologist Schneider concludes that recently discovered documents and archaeological evidence are effectively proof of co-regencies in this period. 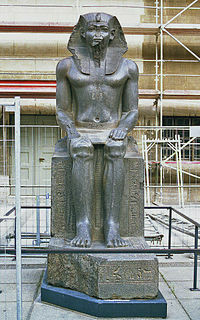 Some sources ascribe a co-regency period to Senusret II's rule, with his father Amenemhat II as his co-regent. The British Egyptologist Peter Clayton ascribes at least three years of co-regency to Senusret II's reign. The French Egyptologist Nicolas Grimal assigns nearly five years of co-regency prior to sole accession to the throne. The lengths of the reigns of Senusret II and Senusret III are one of the main considerations for discerning the chronology of the Twelfth Dynasty. The Turin Canon is believed to assign a reign of 19 years to Senusret II and 30 years of reign to Senusret III. This traditional view was challenged in 1972 when the American Egyptologist William Kelly Simpson observed that the latest attested regnal year for Senusret II was his 7th, and similarly for Senusret III his 19th. Kim Ryholt, a professor of Egyptology at the University of Copenhagen, suggests the possibility that the names on the canon had been misarranged and offers two possible regnal lengths for Senusret II: 10+ years, or 19 years. Several Egyptologists, such as Thomas Schneider, cite Mark C. Stone's article, published in the Göttinger Miszellen in 1997, as determining that Senusret II's highest recorded regnal year was his 8th, based on Stela Cairo JE 59485. At present, the problem concerning the reign length of Senusret II is irresolvable but many Egyptologists today prefer to assign him a reign of 9 or 10 years only given the absence of higher dates attested for him beyond his 8th regnal year. This would entail amending the 19-year figure which the Turin Canon assigns for a 12th dynasty ruler in his position to 9 years instead. 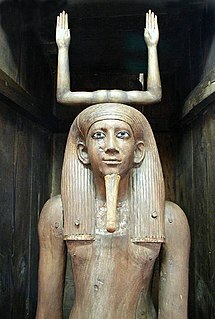 However, Senusret II's monthly figure on the throne might be ascertained. According to Jürgen von Beckerath, the temple documents of El-Lahun, the pyramid city of Sesostris/Senusret II often mention the Festival of "Going Forth to Heaven" which might be the date of death for this ruler. These documents state that this Festival occurred on IV Peret day 14. The Faiyum Oasis, a region in Middle Egypt, has been inhabited by humans for more than 8000 years. It became an important centre in Egypt during the Middle Kingdom. Throughout the period, rulers undertook developmental projects turning Faiyum into an agricultural, religious, and resort-like centre. The oasis was located 80 km (50 mi) south-west of Memphis offering arable land centred around Lake Moeris, a natural body of water. Senusret II initiated a project to exploit the marshy region's natural resources for hunting and fishing, a project continued by his successors and which "matured" during the reign of his grandson Amenemhat III. To set off this project, Senusret II developed an irrigation system with a dyke and a network of canals which siphoned water from Lake Moeris. The land reclaimed in this project was then farmed. Cults honouring the crocodile god Sobek were prominent at the time. Senusret II's reign ushered in a period of peace and prosperity, with no recorded military campaigns and the proliferation of trade between Egypt and the Near-East. There is an absence of serious evidence for a co-regency between Senusret II and Senusret III. Murnane identifies that the only existing evidence for a coregency of Senusret II and III is a scarab with both kings names inscribed on it. The association can be explained as being the result of retroactive dating where Senusret II's final regnal year was absorbed into Senusret III's first one, as would be supported by contemporaneous evidence from the Turin Canon which give Senusret II a regnal duration of 19 full regnal years and a partial one. A dedicatory inscription celebrating the resumption of rituals begun by Senusret II and III, and a papyrus with entries identifying Senusret II's nineteenth regnal year and Senusret III's first regnal year are scant evidence and do not necessitate a coregency. Murnane argues that if there was a coregency, it could not have lasted more than a few months. The evidence from the papyrus document is now obviated by the fact that the document has been securely dated to Year 19 of Senusret III and Year 1 of Amenemhet III. At present, no document from Senusret II's reign has been discovered from Lahun, the king's new capital city. In 1889, the English Egyptologist Flinders Petrie found "a marvellous gold and inlaid royal uraeus" that must have originally formed part of Senusret II's looted burial equipment in a flooded chamber of the king's pyramid tomb. It is now located in the Cairo Museum. The tomb of Princess Sithathoriunet, a daughter of Senusret II, was also discovered by Egyptologists in a separate burial site. Several pieces of jewellery from her tomb including a pair of pectorals and a crown or diadem were found there. They are now displayed at the Metropolitan Museum of New York or the Cairo Museum in Egypt. In 2009, Egyptian archaeologists announced the results of new excavations led by egyptologist Abdul Rahman Al-Ayedi. They described unearthing a cache of pharaonic-era mummies in brightly painted wooden coffins near the Lahun pyramid. The mummies were reportedly the first to be found in the sand-covered desert rock surrounding the pyramid. The pyramid was built around a framework of limestone radial arms, similar to the framework used by Senusret I. Instead of using an infill of stones, mud and mortar, Senusret II used an infill of mud bricks before cladding the structure with a layer of limestone veneer. The outer cladding stones were locked together using dovetail inserts, some of which still remain. A trench was dug around the central core that was filled with stones to act as a French Drain. The limestone cladding stood in this drain, indicating that Senusret II was concerned with water damage. There were eight mastabas and one small pyramid to the north of Senusret's complex and all were within the enclosure wall. The wall had been encased in limestone that was decorated with niches, perhaps as a copy of Djoser's complex at Saqqara. The mastabas were solid and no chambers have found within or beneath, indicating that they were cenotaphs and possibly symbolic in nature. 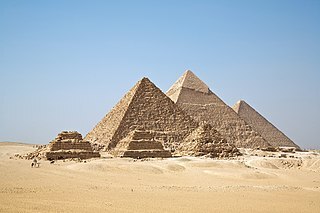 Flinders Petrie investigated the auxiliary pyramid and found no chambers. Limestone slab showing the cartouche of Senusret II and the name and image of the goddess Nekhbet. From Mastaba 4, north side of Senusret II Pyramid at Lahun, Egypt. The Petrie Museum of Egyptian Archaeology, London. The entrances to the underground chambers were on the southern side of the pyramid, which confused Flinders Petrie for some months as he looked for the entrance on the traditional northern side. The builders vertical access shaft had been filled in after construction and the chamber made to look like a burial chamber. This was no doubt an attempt to convince tomb robbers to look no further. A secondary access shaft led to a vaulted chamber and a deep well shaft. This may have been an aspect of the cult of Osiris, although it may have been to find the water table. A passage led northwards, past another lateral chamber and turned westwards. This led to an antechamber and vaulted burial chamber, with a sidechamber to the south. The burial chamber was encircled by a unique series of passages that may have reference to the birth of Osiris. A large sarcophagus was found within the burial chamber; it is larger than the doorway and the tunnels, showing that it was put in position when the chamber was being constructed and it was open to the sky. The limestone outer cladding of the pyramid was removed by Rameses II so he could re-use the stone for his own use. He left inscriptions that he had done so. ^ Proposed dates for Senusret II's reign: c. 1900–1880 BCE, c. 1897–1878 BCE, c. 1897–1877 BCE, c. 1895–1878 BCE, c. 1877–1870 BCE. ^ A document with regnal dates for two kings. One such double-date is found on the stela from Konosso cited by Jansen-Winkeln, which identifies Senusret II's third regnal year first, and Amenemhat II's thirty-fifth regnal year after it. ^ a b c d e Grimal 1992, p. 166. ^ Dodson & Hilton 2004, p. 289. ^ Lehner 2008, p. 8. ^ Arnold 2003, p. 267. ^ a b c Clayton 1994, p. 78. ^ Frey 2001, p. 150. ^ Grimal 1992, p. 391. ^ Shaw 2004, p. 483. ^ a b c Callender 2004, p. 152. ^ a b c d e f Leprohon 2013, p. 59. ^ Verner 2002, p. 386. ^ Petrie 1891, p. 5ff. ^ Clayton 1994, p. 83. ^ Callender 2004, pp. 137–138. ^ a b Simpson 2001, p. 453. ^ Schneider 2006, p. 170. ^ Delia 1997, pp. 267–268. ^ Jansen-Winkeln 1997, pp. 115–135. ^ Schneider 2006, pp. 170–171. ^ a b Jansen-Winkeln 1997, pp. 188–189. ^ Schneider 2006, p. 172. ^ Schneider 2006, p. 171. ^ Clayton 1994, p. 82. ^ a b Ryholt 1997, p. 14. ^ Ryholt 1997, pp. 14–15. ^ Schneider 2006, p. 172 citing Stone (1997, pp. 91–100). ^ Yurco 2014, p. 69 citing Edwards (1985, pp. 98 & 292); and Grimal (1992, pp. 166 & 391). ^ von Beckerath 1995, p. 447. ^ Borchardt 1899, p. 91. ^ Gardiner 1945, pp. 21–22. ^ Simpson n.d., LA V900. ^ a b c d e Wilfong 2001, p. 496. ^ Callender 2004, pp. 152–153. ^ Jansen-Winkeln 1997, p. 119. ^ a b c Murnane 1977, p. 9. ^ Murnane 1977, p. 228. ^ Clayton 1994, p. 80. ^ See El-Lahun recent discoveries and online Cache of mummies unearthed at Egypt's Lahun pyramid. Arnold, Dieter (2003). The Encyclopaedia of Ancient Egyptian Architecture. London: I.B Tauris & Co Ltd. ISBN 978-1-86064-465-8. Borchardt, Ludwig (1899). Erman, A.; Steindorff, G. (eds.). "Der zweite Papyrusfund von Kahun und die zeitliche Festlegung des mittleren Reiches der ägyptische Geschichte". Zeitschrift für ägyptische Sprache und Altertumskunde (in German). Leipzig: J. C. Hinrichs'sche Buchhandlung (37): 89–103. ISSN 2196-713X. Callender, Gae (2004). "The Middle Kingdom Rennaissance (c.2055–1650 BC)". In Shaw, Ian (ed.). The Oxford History of Ancient Egypt. Oxford: Oxford University Press. pp. 137–171. ISBN 978-0-19-815034-3. Clayton, Peter (1994). Chronicle of the Pharaohs. London: Thames & Hudson Ltd. ISBN 978-0-500-05074-3.
de Morgan, Jacques; Bouriant, Urbain; Legrain, Georges Albert; Jéquier, Gustave; Barsanti, Alfred (1894). Catalogue des monuments et inscriptions de l'Ègypte (in French). Vienne: Adolphe Holzhausen. OCLC 741162031. Delia, Robert D. (1997). "Sésostris Ier; Étude chronologique et historique de règne. Étude No. 5 by Claude Obsomer". Journal of the American Research Center in Egypt (in French): 267–268. doi:10.2307/40000813. ISSN 0065-9991. Edwards, Iorwerth Eiddon Stephen (1985). The Pyramids of Egypt. New York: Penguin Books. ISBN 978-0-140-22549-5. Frey, Rosa A. (2001). "Illahun". In Redford, Donald B. (ed.). The Oxford Encyclopedia of Ancient Egypt, Volume 2. Oxford: Oxford University Press. pp. 150–151. ISBN 978-0-19-510234-5. Gardiner, Alan H. (1945). "Regnal Years and Civil Calendar in Pharaonic Egypt". The Journal of Egyptian Archaeology. 31 (1): 11–28. doi:10.2307/3855380. ISSN 0307-5133. Jansen-Winkeln, Karl (1997). "Zu den Koregenz der 12. Dynastie" (PDF). Studien zur Altägyptischen Kultur (in German) (24): 115–135. ISSN 0340-2215. Murnane, William J. (1977). "Ancient Egyptian Coregencies". Studies in Ancient Oriental Civilization (SAOC). Chicago: The Oriental Institute of the University of Chicago (40). ISBN 978-0-918986-03-0. ISSN 0081-7554. Petrie, W. M. F. (1891). Illahun, Kahun and Gurob. London. Ryholt, Kim Steven Bardrum (1997). The Political Situation in Egypt during the Second Intermediate Period, c. 1800–1550 B.C. CNI publications, 20. Copenhagen: Museum Tusculanum Press: University of Copenhagen. ISBN 978-87-7289-421-8. Schneider, Thomas (2006). "The relative chronology of the Middle Kingdom and the Hyksos Period (Dyns. 12–17)". In Hornung, Erik; Krauss, Rolf; Warburton, David A. (eds.). Ancient Egyptian Chronology. Leiden, Boston: Brill. pp. 168–196. ISBN 978-90-04-11385-5. Shaw, Ian, ed. (2004). The Oxford History of Ancient Egypt. Oxford: Oxford University Press. ISBN 978-0-19-815034-3. Simpson, W. K. (n.d.). LA V900. Simpson, William Kelly (2001). "Twelfth Dynasty". In Redford, Donald B. (ed.). The Oxford Encyclopedia of Ancient Egypt, Volume 3. Oxford: Oxford University Press. pp. 453–457. ISBN 978-0-19-510234-5. Stone, Mark (1997). "Reading the Highest Attested Date for Senwosret II: Stela Cairo JE 59485". Göttinger Miszellen (159): 91–100. ISSN 0344-385X. Verner, Miroslav (2001e). The Pyramids: The Mystery, Culture and Science of Egypt's Great Monuments. New York: Grove Press. ISBN 978-0-8021-1703-8. Verner, Miroslav (2002). The Pyramids: The Mystery, Culture, and Science of Egypt's Great Monument. New York: Grove Press. von Beckerath, Jürgen (1995). "Nochmals zur Chronologie der XII. Dynastie". Orientalia. Gregorian Biblical Press. 64 (4): 445–449. ISSN 0030-5367. Wilfong (2001). "Faiyum". In Redford, Donald B. (ed.). The Oxford Encyclopedia of Ancient Egypt, Volume 1. Oxford: Oxford University Press. pp. 496–497. ISBN 978-0-19-510234-5. Yurco, Frank (2014). "Black Athena: An Egyptological Review". In Lefkowitz, Mary; Rogers, Guy Maclean (eds.). Black Athena Revisited. Chapel Hill: University of North Carolina Press. pp. 62–100. ISBN 978-0-8078-4555-4. Wikimedia Commons has media related to Senusret II. The Middle Kingdom of Egypt is the period in the history of ancient Egypt following a period of political division known as the First Intermediate Period. The Middle Kingdom lasted from around 2050 BC to around 1710 BC, stretching from the reunification of Egypt under the reign of Mentuhotep II of the Eleventh Dynasty to the end of the Twelfth Dynasty. The Eleventh Dynasty ruled from Thebes and the Twelfth Dynasty ruled from el-Lisht. Some scholars also include the Thirteenth Dynasty of Egypt wholly into this period as well, in which case the Middle Kingdom would finish around 1650, while others only include it until Merneferre Ay around 1700 BC, last king of this dynasty to be attested in both Upper and Lower Egypt. During the Middle Kingdom period, Osiris became the most important deity in popular religion. The Middle Kingdom was followed by the Second Intermediate Period of Egypt, another period of division that involved foreign invasions of the country by the Hyksos of West Asia. Shebitku was the second king of the Twenty-fifth Dynasty of Egypt who ruled from 714 BC-705 BC, according to the most recent academic research. He was a son of Piye, the founder of this dynasty. Shebitku's prenomen or throne name, Djedkare, means "Enduring is the Soul of Re." Shebitku's queen was Arty, who was a daughter of king Piye, according to a fragment of statue JE 49157 of the High Priest of Amun Haremakhet, son of Shabaka, found in the temple of the Goddess Mut in Karnak. Amenemhat IV was the seventh and penultimate pharaoh of the 12th Dynasty of Egypt during the late Middle Kingdom period, ruling for over nine years in the late 19th century BC or the early 18th century BC. Usermaatre Amenemope was an ancient Egyptian pharaoh of the 21st Dynasty. King Hedjkheperre Setepenamun Harsiese or Harsiese A, is viewed by the Egyptologist Kenneth Kitchen in his Third Intermediate Period in Egypt to be both a High Priest of Amun and the son of the High Priest of Amun, Shoshenq C. The archaeological evidence does suggest that he was indeed Shoshenq C's son. However, recent published studies by the German Egyptologist Karl Jansen-Winkeln in JEA 81 (1995) have demonstrated that all the monuments of the first (king) Harsiese show that he was never a High Priest of Amun in his own right. Rather both Harsiese A and his son [...du] —whose existence is known from inscriptions on the latter's funerary objects at Coptos —are only attested as Ordinary Priests of Amun. 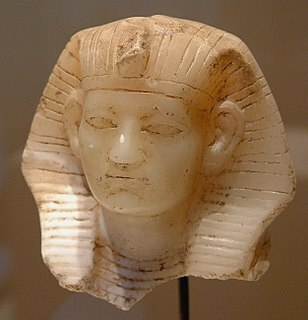 Instead, while Harsiese A was certainly an independent king at Thebes during the first decade of Osorkon II's kingship, he was a different person from a second person who was also called Harsiese: Harsiese B. Harsiese B was the genuine High Priest of Amun who is attested in office late in Osorkon II's reign, in the regnal year 6 of Shoshenq III and in regnal years 18 and 19 of Pedubast I, according to Jansen-Winkeln. Sithathoriunet was an Ancient Egyptian king's daughter of the 12th dynasty, mainly known from her burial at El-Lahun in which a treasure trove of jewellery was found. She was possibly a daughter of Senusret II since her burial site was found next to the pyramid of this king. If so, this would make her one of five known children and one of three daughters of Senusret II—the other children were Senusret III, Senusretseneb, Itakait and Nofret. The Pyramid of Senusret II,, is the pyramid complex constructed for the pharaoh Senusret II in the Twelfth Dynasty.